Are Your Windows Ready for All Types of Weather? Mississauga is known for its very cold winters and its warm summers. The city doesn't get severe storms, but it does get plenty of rainfall in the spring and summer. 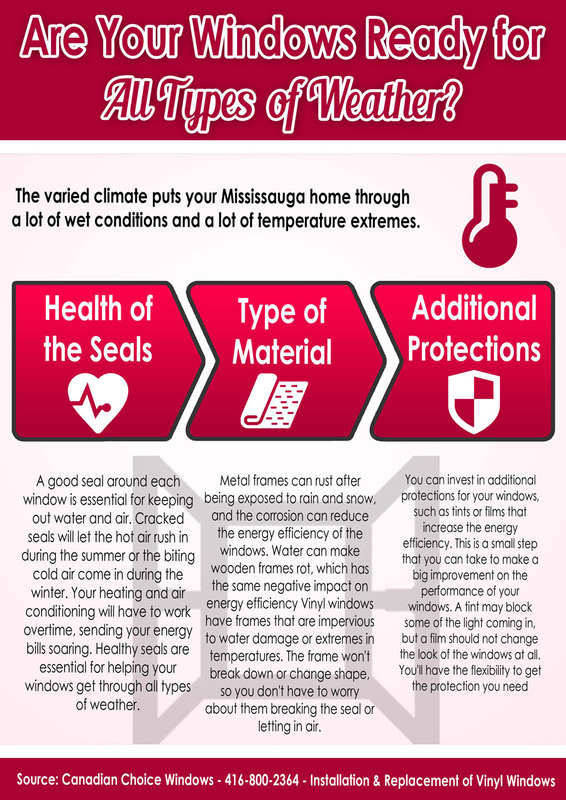 The varied climate puts your Mississauga home through a lot of wet conditions and a lot of temperature extremes. A good seal around each window is essential for keeping out water and air. Cracked seals will let the hot air rush in during the summer or the biting cold air come in during the winter. Your heating and air conditioning will have to work overtime, sending your energy bills soaring. Healthy seals are essential for helping your windows get through all types of weather. Metal frames can rust after being exposed to rain and snow, and the corrosion can reduce the energy efficiency of the windows. Water can make wooden frames rot, which has the same negative impact on energy efficiency. Vinyl windows have frames that are impervious to water damage or extremes in temperatures. The frame won't break down or change shape, so you don't have to worry about them breaking the seal or letting in air. Vinyl windows also offer additional protection during extreme temperatures because the glass panes are padded with pockets of air. This improves the overall energy efficiency of the home, putting less strain on the heating and cooling system no matter what the weather is doing outside. You can invest in additional protections for your windows, such as tints or films that increase the energy efficiency. This is a small step that you can take to make a big improvement on the performance of your windows. A tint may block some of the light coming in, but a film should not change the look of the windows at all. You'll have the flexibility to get the protection you need without sacrificing the look. Vinyl windows are the ideal choice for your Mississauga home since they stand up to all types of weather conditions. If you are ready to shop for your new vinyl windows, refer to a windows replacement company in Mississauga.